One of the first lessons we learn about storytelling is that when we show (and tell), our stories are more interesting. That’s why kids bring in items from home to show-and-tell classmates about things they care about. When it comes to saving energy, finding ways to show what success looks like (and that means going beyond a CFL light bulb photo) is especially important. Energy itself is invisible, which means that to fulfill our innate craving for visual content, it takes some creativity and a little legwork to find the images that give us something interesting to look at. In case you missed it at the end of 2014, Chicago’s first-ever energy benchmarking report (measuring and rating building energy performance, per city ordinance) is well worth a look. 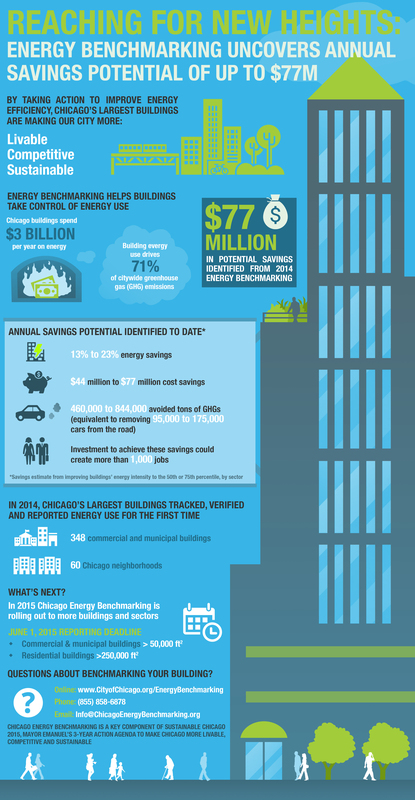 The 2014 City of Chicago Building Energy Benchmarking Report finds millions of dollars in savings are possible in the city’s largest commercial buildings. The cool thing about this report is that there’s plenty of “show” to go along with the “tell” about energy efficiency success. This is one of the most graphically rich city benchmarking reports we’ve seen, and really puts a face on some of the folks leading Chicago’s charge to increase energy efficiency. Images and testimonials from leaders in key building sectors (such as healthcare) show and tell how energy benchmarking is boosting today’s bottom line and inspiring tomorrow’s innovations. 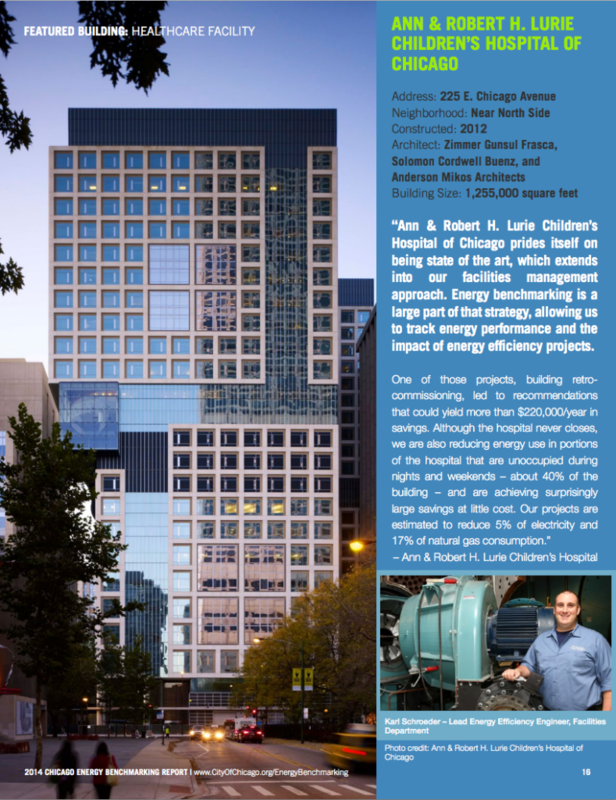 For example, at the Ann & Robert H. Lurie Children’s Hospital of Chicago, being a state-of-the art hospital extends into facilities management. Although the hospital never closes, some portions of the building—about 40 percent—are unoccupied during nights and weekends, and the hospital is achieving surprisingly large savings at little cost by reducing energy use in these areas. Another project could yield more than $220,000 in annual energy savings. And it’s much more compelling, visually, because this and the other testimonials include photos of the beautiful buildings and the smiling people who made it all happen. Photo credit: Ann & Robert H. Lurie Children’s Hospital of Chicago. If this has you craving more about messaging and imagery tips, we can help! Download our guide, “Beyond the CFL: Winning Imagery for Energy Efficiency,” or check out our tip sheet.